Dragon is the legendary icon which has the physical characteristics with magical ability of all kinds of animals such as the aerial birds, ground beasts, and the water fish; the sky flying , land speedy running and the sea diving are transcendent and are symbols of dignity as well, and also, it is the first of the five spirits. 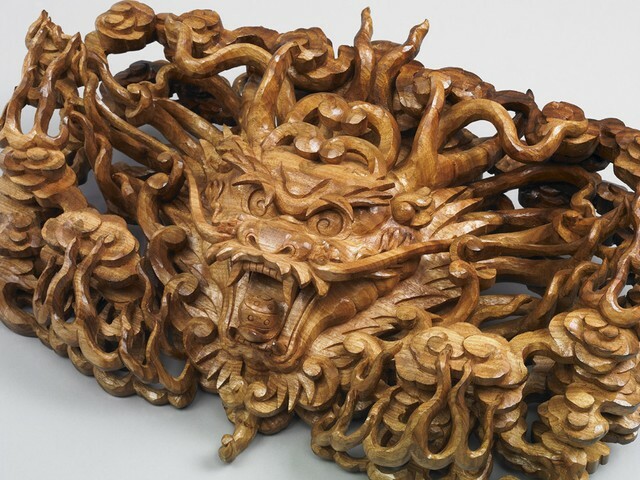 The entire work is cored on the dragon head at the front, surrounded by winding Chinese character Ju-yi-shaped clouds and flame-like decoration, combining relief sculpture and openwork techniques to be integrally molded, performing the beauty of inside and outside space and multilayer. Its theme contour lines are smooth, meandering and reverberating, skillful decorative, and it fully displays the transcendent dignity and artistic sense of dragon head moving in and out with wizardly elusiveness. So that the mysterious image becomes more massive and unpredictable, which is an infinite zoom in imagination and having those who appreciate ponder infinitely.